The measurement of Stress in underground workings is very important but difficult to achieve. HMA Geotechnical offers two types of Rock Stress Monitoring systems for borehole application. The first is a hydraulic type stressmeter which is similar in principle to an Earth Pressure Cell. 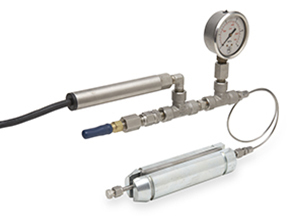 This can be read using a bourdon tube pressure gauge or an electronic pressure sensor. The second type is a Vibrating Wire Stressmeter which works on a proving ring principle and is extremely sensitive. Both are installed in specially drilled boreholes and both can be read remotely.